The showroom at Wave Surfaces is a far cry from typical displays you might find elsewhere in the industry. Wave Surfaces is a Perth, Australia, based fabrication specialist with more than 30 years’ experience in manufacturing countertops (or “bench tops” as they are referred to in Australia) for commercial and residential applications. While the company offers a diverse product range that includes quartz surfacing, granite, marble and porcelain, as Perth’s largest solid surface fabricator, the company’s skill set goes well beyond the typical. With a penchant for thermoforming solid surface and the craftsmanship to back it up, the company is not shy in showing off its 3-D capabilities, and that is heavily reflected in its showroom. 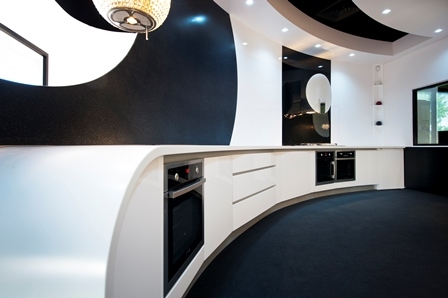 Figure 1 – Sweeping curves of thermoformed dark and light contrasting Staron solid surface make Wave Surfaces showroom unique and help potential customers better imagine the possibilities. No one who has had the pleasure of seeing Wave Surfaces showroom will accuse the company of having just another run-of-the mill display area. Visiting the showroom is an experience in the possible, not the predictable. 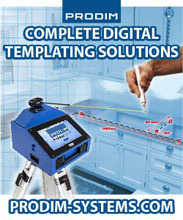 Gone are the typical straight lines, flat surfaces and commonplace countertops of the past. The showroom is a real testament to the capabilities and vision of the company and the properties of the acrylic solid surface materials they work with. 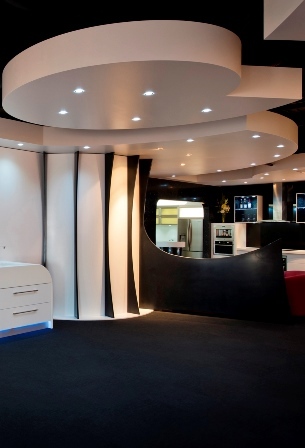 Sweeping curves of contrasting dark and light Staron solid surface dominate the showroom, helping potential customers to visualize the possibilities for their own concepts and projects (see Figure 1). Staron solid surface is used for the countertops, sinks and service areas, and has even been cleverly incorporated into the cladding, cabinetry and ceilings. To further accentuate the versatility of product and craftsmanship, a number of unique sculptures accentuate just what can be done with the material. 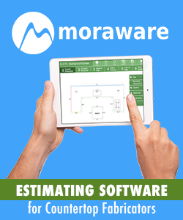 Showrooms of this understated complexity and functionality require a designer with vision and whom is willing to push the known boundaries of product and craftsmanship. To this end Wave Surfaces engaged Peter Carman principle designer for award-winning company Dakota Design. Also based in Perth, Dakota Design has handled complex design projects all over Australia and the world, with much success and praise. Carman’s talent and expertise certainly showed amply in this project as well. Figure 2 – Wave Surfaces’ logo inspired the design of the showroom, and the company even went so far as to create a 3-D solid surface version of the logo in large scale with recessed lights to create a ceiling feature piece in the center of the showroom. 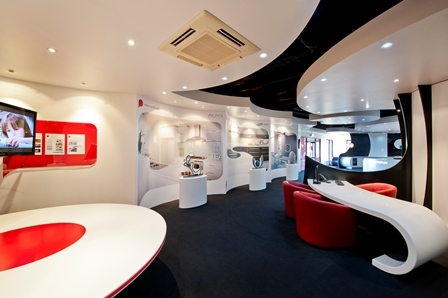 Carman used the Wave Surfaces logo (which is reminiscent of the roll of a large wave) as the design concept, and represented it in different aspects of the showroom. 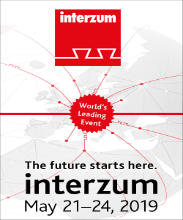 Solid surface was formed into a large-scale company logo, and recessed lighting was installed directly into the material to create a ceiling feature piece in the center of the showroom (see Figure 2). Thermoformed Staron flows around the space emphasizing the ‘wavy’ theme. This includes curved countertops continuing seamlessly to cladded cabinets that integrate vertically into the walls (see Figure 3). To identify the sample and sink display areas of the showroom, another property of solid surface was made the focal point. The back of the solid surface sheets were etched and then backlit so that the words ‘colour samples’ and ‘integrated sinks’ are illuminated (see Figure 4). Carman also designed beautiful artistic sculptures that were then made by thermoforming and inlaying two contrasting colors of solid surface (Staron’s Sanded Onyx and Bright White) to create effective and interesting ‘black and white’ show pieces (see Figure 5). 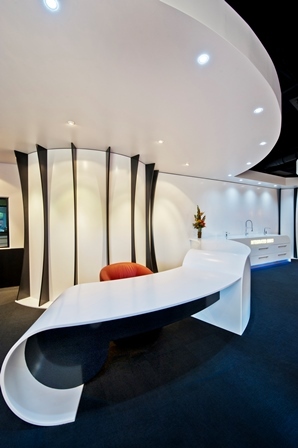 Figure 3 – Thermoformed solid surface in a variety of applications, such as countertops, cabinet and wall cladding, and even the ceilings, flows around the space emphasizing the ‘wavy’ theme. Every aspect of the showroom features a soft curve or wave emphasizing the brand and logo of Wave Surfaces. The beautiful design and skillful fabricating techniques have pushed every boundary of design in this project. Wave Surfaces exclusively use Peter for their entire in-house design consultancy, so that every customer, no matter the project size, can be ensured they are receiving the very best of design advice. 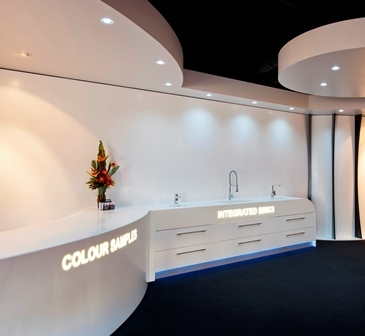 Figure 4 – Showing off another ability of solid surface, the back of the sheets were etched and then backlit so that the words ‘colour samples’ and ‘integrated sinks’ are illuminated. With more than 30 years’ experience, Larry “Bertie” Watkins founded the company in a small factory in Bayswater, a northeastern suburb of Perth. With Perth being the capital of Western Australia (the country’s largest state, encompassing the western third of the country), the business has experienced steady growth since its inception. In 2007 the business moved to larger premises in Maddington, about 12 miles from Perth’s Central Business District, after acquiring a retiring colleague’s company that had established the original showroom and shop. In 2009, the company doubled the size of its manufacturing center and in 2011 realized a refurbished show room more in line with modern trends was a necessity, which lead to the current incarnate of the showroom. Wave Surfaces employs approximately 25 full-time craftsmen, as well as seasonal labor as required to service the company’s extensive Australian client base. The company continues to be family-owned and operated by Watkins, who has his roots in cabinet making and countertop fabrication. This has led to the company’s expansion into a variety of brands of solid surface and quartz surfacing, as well as different types of natural stone. In order to accommodate intricate fabrication of all of these products, the company has invested in a state-of-the-art fabrication facility that includes a CNC Router, a V-groover, a thermoforming oven and vacuum press for shaping solid surface, as well as various air-powered tools. The company’s stone shop houses a CNC machine, edge polisher, miter saw and bridge saw, all of which are operated by a central computer. On average, Watkins estimates that about 10 percent of his business is in natural stone, while the remaining 90 percent is split about evenly between solid surface and engineered stone. Wave Surfaces fabricates and install in excess of 150 jobs per month with a mixture of residential and commercial applications, with a majority of the daily work being for local builders, cabinet makers and shop fitters, and a small percentage of jobs being for private clients. Figure 5 – Peter Carman of Dakota Design designed these unique sculptures that were made by thermoforming and inlaying two contrasting colors of solid surface (Staron’s Sanded Onyx and Bright White) to create effective and interesting pieces that showcase the material’s versatility. Obviously the thermoforming abilities at Wave Surfaces are fine-tuned, but what prompted the to expand beyond just flat surfaces into these non-traditional forms? The customers. This flair for the exotic, as well as bringing on an in-house designer and comprehensive design service, has certainly paid off for the company, as its primary source of business is word-of-mouth referrals. “Wave Surfaces has a long standing reputation in the bench top fabrication industry and we rely mostly on referrals from our happy clients to gain more work,” said Watkins. 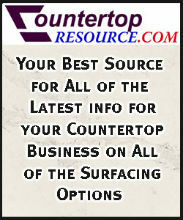 For more information about Wave Surfaces visit www.wavesurfaces.com.au. For more information about Dakota Design visit www.dakotadesign.com.au.